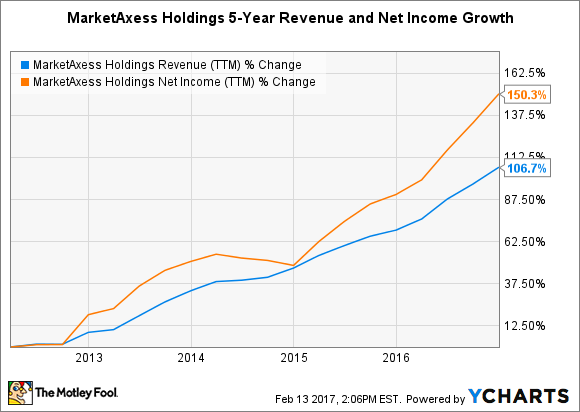 MarketAxess Holdings, Elli Mae, and Abiomed have all been home run stocks, but can investors expect the gains to continue? I'm a firm believer that winning stocks tend to keep on winning. That's why I regularly sift through lists of the best-performing stocks as a way to generate investing ideas. Below is a list of three stocks -- MarketAxess Holdings (NASDAQ:MKTX), Elli Mae (NYSE:ELLI), and Abiomed (NASDAQ:ABMD) -- that have all tripled in value over the past three years. Here's a closer look at why all three companies seem poised to put up even more gains. In today's hyper-connected world it's easy to assume that the majority of fixed-income trading happens online, but that's not the case. Buying and selling in the debt markets still primarily occurs via one-on-one negotiations over the phone or by email. Since its inception in 2000, MarketAxess has been looking to change all of that. The company created an electronic trading platform that provides bond investors with far more transparency, making it easy to buy or sell fixed-income securities. What's wonderful about this business model is that it doesn't cost the company much to process additional volume. That has allowed an ever increasing share of the company's revenue growth to fall to the bottom line. While the company's platform continues to grow in popularity, MarketAxess' overall market share is still quite small. That means there is plenty more room for top- and bottom-line growth. If true, then it wouldn't surprise me to see this stock's upwards trajectory continue. Every homeowner knows how tough it can be to get a mortgage, but imagine how difficult the transaction is for the brokers. Elli Mae knows first hand just how complicated the process is for mortgage professionals, so they set out to create a better way. The company called its solution Encompass. This cloud-based software makes the mortgage origination process far easier by helping to organize all facets of its business. Encompass helps its users with relationship management, title searches, flood insurance, appraisals, the closing process, and more. Mortgage professionals have been tripping over themselves in recent years to get on the platform. As of the end of 2016, Elli Mae's active user count exceed 164,000, which was up 21% year over year. Better yet, users continue to order ever more services from Encompass, which drove average revenue per user up by an even stronger 24% to $587. Looking ahead, Elli Mae is projecting another year of strong growth. The top line is expected to jump by 22% on the back of continued user growth. With the housing recovery in full swing and millennials finally starting to settle down and start families, Ellie Mae's future continues to look bright. Roughly 735,000 Americans have a heart attack each year. That huge number is a big reason why heart disease is the leading cause of death in the U.S.
Abiomed is a medical device company that is committed to greatly increasing the survival rate for heart attack sufferers. The company created a minimally invasive implantable pump that helps keep a patient's heart pumping during heart surgery or after a heart attack. The device has been a huge hit with the medical community since it has been shown to reduce a patient's risk of death and lower hospital costs. That's a powerful combination. Abiomed's top line has been growing like crazy over the last few years as it has raced to keep up with soaring demand. That has allowed the company to swing into the black, and it's been pumping out huge profit growth ever since. Management continues to believe that the company still has plenty of room for growth. That belief stems from the fact that its penetration rate in the U.S. is only 7%. That figure is even lower in abroad markets where the device is cleared, like Germany and Japan. With new products on the way and plenty of room for expansion, management is projecting top-line growth of 34% in 2017. As long as the company can continue to grow at above-average rates, I wouldn't be surprised to see its stock continue to follow suit.